I’ve been a fan of TomTom Live products ever since they launched HD Traffic which was put set up for New Zealand and Australia by GeoSmart has saved me so much time over recent years, whether its getting to a business meeting on time (or letting them know exactly what time I would get there) or to my childrens’ concerts and sport competitions. I love the new TomTom Live Carpark feature! It doesn’t just find a car park it finds an available car park closest to the destination you enter! The signs on city streets that tell you how many car parks are available are ok, but you have to drive to where the signs are to find out which car park to head to and it could be quite a way from your destination. The new TomTom feature now hooks up to curbside car parks that have sensors monitoring them which connect to the network. It even tells you how long the car parks are available for and how much they cost. It’s been really good for local residents in Ponsonby who had a real problem in the past with commuters parking outside their homes, many of which don’t have off road parking, they get exclusive resident access to those parks after 6PM and they don’t show on the TomTom again until 7 the following morning. It’s also really good when I go to visit business partners like Tech Day in Ponsonby, notorious for having to circle like a seagull a couple of times before finding a park. The other day I went to my Second Friday Networking Lunch meetup in Ponsonby. I often get there a little late and scramble for a car park and hoping they haven’t started without me. This time I just set my destination on the TomTom and it found me a car park on a side street about half a kilometer from the restaurant I was heading to. That was OK, it wasn’t raining for once, but then just before I got there, it chimed and said, “There is now a car park closer to your destination, would you like to re-route?” Nek minnit (OK I know that’s a bit old school now) I’m getting out of my car right at the front door of Safron. They say there are two kinds of people in the world, those that find car parks and other people. 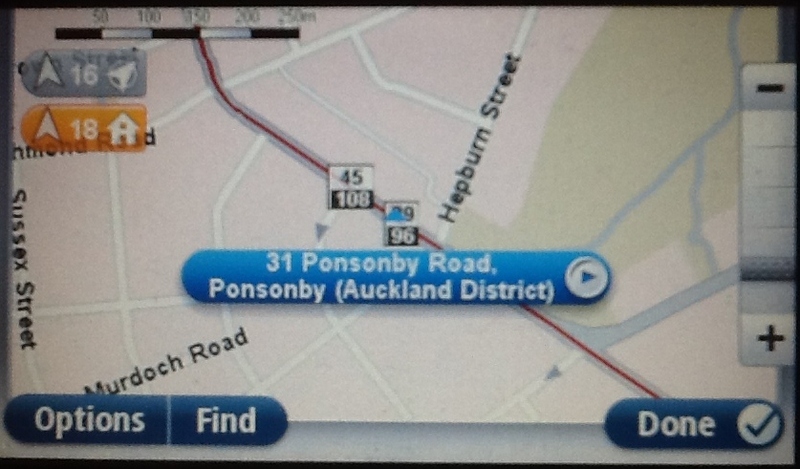 With my new TomTom feature I am definitely one of the former.